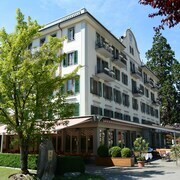 We thoroughly enjoyed our stay at the Hotel Interlaken. Upon arrival, the staff directed us to important tourist spots in the town, as well as to the tourist centre for more assistance which was very helpful . The hotel also advised us of the free town buses during our stay. We were lucky enough to receive a hotel upgrade. Where to find Interlaken hotels near an airport? How can I find hotels in different Interlaken neighborhoods? Where can I find hotels in Interlaken that are near tourist attractions? If you're visiting the Bernese Alps area and you're after short- or long-stay accommodation in Interlaken, you'll find an extensive range to choose from. Within Expedia's handy accommodation pages you'll discover 76 accommodation choices within a 0.1-kilometre (0.06-mile) radius of Interlaken's center. Interlaken offers a range of centrally located accommodations, such as the Victoria Jungfrau Grand Hotel & Spa and Hotel Bellevue. If you are budget aware and are after deals on Interlaken hotels, we also have plenty of economy lodgings to choose from in the area. 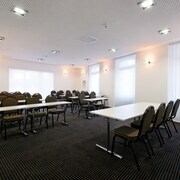 The Hotel Toscana is 0.1 kilometres (0.1 miles) from the center of Interlaken, while the City Oberland Swiss Quality Hotel is 0.07 kilometres (0.04 miles) away. 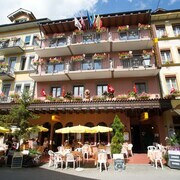 Two more options in the cheaper range of Interlaken accommodations include the Hotel Derby and the Hotel Harder Minerva. 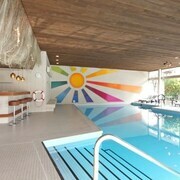 The Wellness & Spa Hotel Beatus is positioned 9 kilometres (6 miles) away from the center of Interlaken. Another option is the Romantik Hotel Schweizerhof Grindelwald, which is positioned 15 kilometres (9 miles) away. Two more hotel options worth checking out around Interlaken include the Beausite Park Hotel and the Eden Swiss Quality Hotel. Adelboden is 30 kilometres (19 miles) to the southwest of Interlaken and is where you'll find Grossstrubel Mountain and Engstligenalp. The The Cambrian and Parkhotel Bellevue & Spa are a few of the Expedia-recommended apartment and hotel alternatives in Adelboden. 50 kilometres (30 miles) to the southwest of Interlaken, you'll find Gstaad - Saanen, which is home to the The Alpina Gstaad and Park Gstaad. If you stay in Gstaad - Saanen, be sure to visit the Wispile Gondola and Ski Lift Eggli. Before your Interlaken trip draws to a close, why not spend an afternoon rubbing shoulders with fellow sports enthusiasts at a local sporting fixture. You'll find Stade de Suisse Wankdorf 45 kilometres (27 miles) to the northwest of Interlaken. 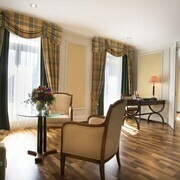 Sleep near the action at the Hotel Bellevue Palace or the Hotel Schweizerhof Bern. If you are traveling into or out of Belp Airport and would like to stay nearby try Apartments Justingerweg or Hotel Sternen Muri. 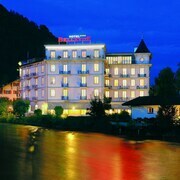 What are the most popular Interlaken hotels? Are there hotels in other cities near Interlaken? 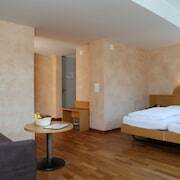 What other types of accommodations are available in Interlaken? Explore Interlaken with Expedia.ca’s Travel Guides to find the best flights, cars, holiday packages and more! Flights from Los Angeles Intl. to Winnipeg James Armstrong Richardson Intl.